After witnessing Takanori Gomi upset 3-to-1 favorite Tyson Griffin at “UFC on Versus 2” this past Sunday, gambleholics across the globe have been counting down to tomorrow night’s “UFC 117: Silva vs. Sonnen” event in order to catch their next underdog fix. Although middleweight champ Anderson Silva has been fairly quiet leading up to his highly anticipated title fight, it doesn’t mean he hasn’t heard or will forget the diversified disses Sonnen has fired his way. To his credit, this is the most the media has ever discussed a challenger of Silva’s. MMA’s most efficient striker – except when he’s “running around and punching the air” as Sonnen likes to say – has rattled off 12 consecutive victories, including three straight title defenses that were nothing to write to Brazil about. Ngo-stradamus remains intrigued with the welterweight top contender scrap between Thiago Alves and Jon Fitch. Although the all-mighty one likes the chances of Alves avenging his loss to the American Kickboxing Academy trained fighter, let’s see how the Brazilian looks at today’s weigh-ins before we pull the trigger. 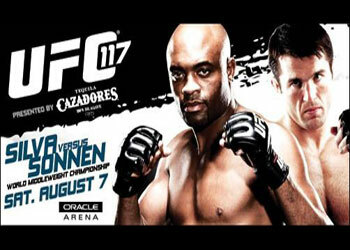 UFC 117 will be jumping off inside Oracle Arena in Oakland, California. The live pay-per-view broadcast starts at 10PM ET/7PM PT.